A couple of weeks ago, I picked up a new Lodge 5 quart Dutch oven with loop handles . This particular Dutch oven is a true kitchen Dutch oven. There's no bail handle on this particular Dutch oven as there has been with my previous ones. Thus, this is specifically a Dutch oven for the kitchen, and not really for the campsite. This coincided with the fact that we still had a pound and a half of crawfish in the freezer from our trip to Louisiana in July. Kathy had been suggesting for a while that we use them in an étouffée, but I wanted to make something with them we'd never made before. I'd been thinking about a crawfish fettuccine which I'd had in restaurants, but had never made myself. However, I'd made other fettuccine dishes before, so I figured it was time to combine the best of both worlds. Kathy and I have a hundred or so cookbooks, so I pulled out about a half dozen different books containing crawfish fettuccine recipes as well as two recipes on the internet and let her decide. I told her she could pick the recipe and I'd make the dish. 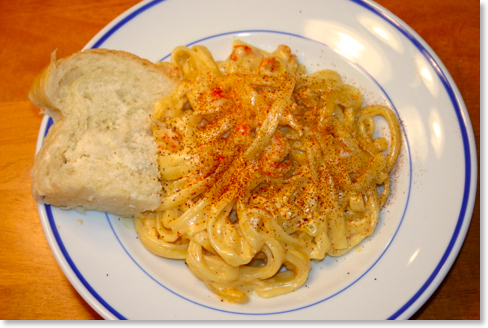 Kathy picked the recipe, "Brenda's Crawfish Fettuccine" from the Real Cajun Recipes website. This recipe looked extremely easy to prepare (and it was), and the ingredient list was fairly simple. She had also been skeptical about bell peppers in fettuccine which I thought was fine, but I wanted to make something both of us would eat. This was the only recipe that did not call for them. 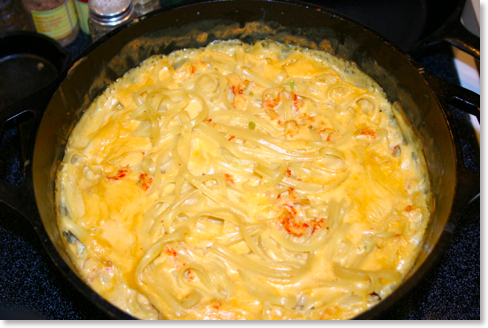 Plus, most of the crawfish fettuccine recipes I looked at simply had the topping placed over the cooked fettuccine. I liked this one because it baked together in one dish. However, I noticed one problem right away. The recipe called for 12 oz. of fettuccine, but the average box sold at the grocer is 16 oz. However, I love that the Real Cajun Recipe website has a built in ability to scale recipes. The original recipes said that it would make 6-8 servings, but what I discovered was that as is, it was actually set to six servings. By increasing it to eight servings, the amount of fettuccine increased to 16 oz. However, the rest of the ingredients were at odd measurements such as one and 3/10 onions. So what you see below is my adaptation as to how I made it. All I can tell you is that it was quite good, and Kathy said it was the best meal she'd ever had (however she says things like that all the time!). 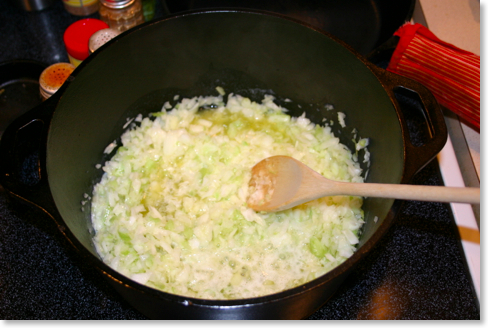 Sauté onions and celery in butter in the bottom of a 5 quart cast iron Dutch oven. 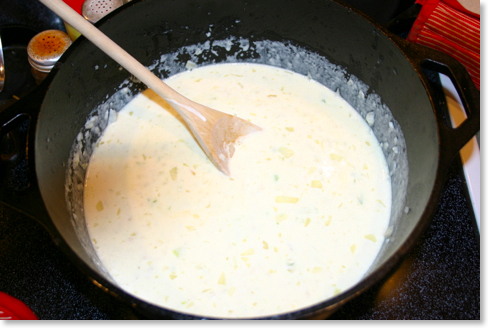 Add flour gradually, then half and half and cheese heat until the cheese is melted. 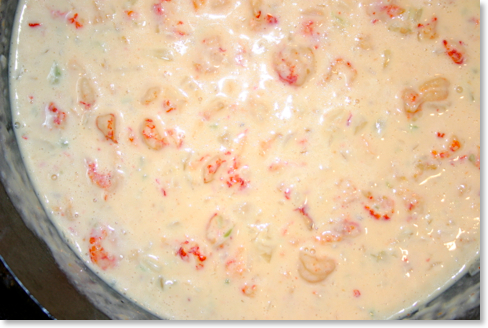 Add crawfish and simmer for approximately 25 minutes, stirring constantly so that mixture does not begin to scorch. Season to taste. Cook fettuccine according to package directions, and add the boiled fettuccine into this mixture. Place in the oven and bake for 20 minutes at 350 degrees. Above: the final product out of the oven. It was bubbling and quite hot. On the plate with a nice piece of homemade bread. A handful of notes: I used one medium-sized onion and one small onion. You could just as easily use two medium onions, and I don't believe it would overpower the recipe. Technically, after converting up to the greater number of portions, you would need more than 8 oz. of Velveeta as called for in the original recipe. It's very difficult to find the 8 oz. package these days, and we had purchased the 16 oz size. We'd already used half of that in another recipe a few days earlier, so the 8 oz. was all we had left. I don't feel that this took away from the recipe at all because of all the cream in it as well. Also, we used a pound and a half of crawfish because that's what we had. Contrary to the look of the plate above, there was almost a crawfish in every bite. If you don't want that much, scale it back to a pound. 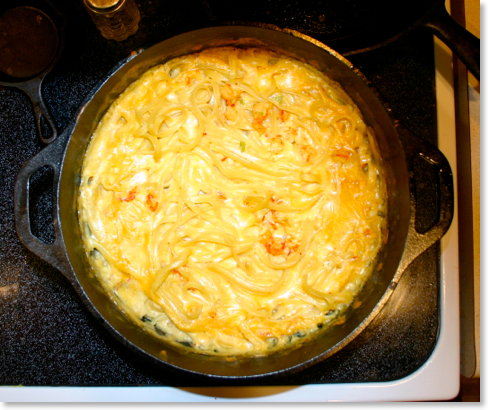 Finally, the original recipe called for everything to be combined in a 2 quart casserole dish. I can't imagine that this would be large enough. With only slightly increasing the ingredients, we filled a five quart dutch oven with only about an inch and a half to spare as you can see in the pictures. The advantage of using one dutch oven is that everything can be cooked in the same pot (with the exception of boiling the pasta).